The plane world has been agog with whispers about new planes from Stanley and confirmation now comes in the latest Tilgear catalogue: Stanley released a quality range bearing the Sweetheart logo. The letters SW in a heart were used in 1920 in celebration of the merger of the Stanley Rule and Level Company into the larger Stanley Works manufacturing company. Stanley Works had used the heart logo on its products in 1915 to honour William Heart who was president of the company from 1884 to 1915. 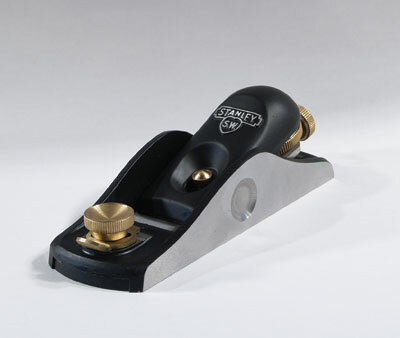 The present-day Stanley manufacturing company has packaged its new plane range in a box referring to the their tool-making history which began in 1884 and displaying the Sweetheart logo. So much for history, what about the actual planes, a No. 4 bench plane and two block planes? I have only had them in my hands for a couple of days as I write so can only give you my first impressions. Both bench and block planes have the frog cast into the ductile iron body. They each have adjustable mouths and heavy 3mm-thick A2 irons. The bench plane also sports a new, patented, lateral adjustment locking mechanism. This consists of a knurled knob on the underside of the frog which bears onto the lateral adjustment pivot. I have to say that I found the lateral adjustment mechanism difficult to use. No doubt regular practice would get me more used to it. The plane felt good in the hand - I think the handle is slightly larger than other planes - and it had good balance. It cut a fine shaving, but the lateral adjustment was a nuisance. The block plane worked better but there was a nasty sharp edge on the nose where the rebates for the sliding sole came through to the toe. These need to have the arises taken off otherwise there is a danger that they will cut you. A No. 9 1/2 block plane is also in the range and I understand a No. 92 shoulder plane is in the offing. 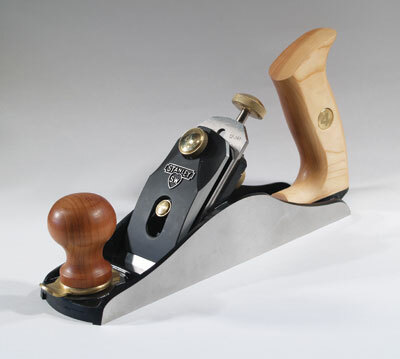 These planes, with nice cherry wood handles, are of better build quality than the Stanley offerings that we have known and used for the last 40 years. They are, however, not in the same league as those of the 'big three' plane-making companies. "Both bench and block planes have the frog cast into the ductile iron body"